This book features stunning artworks by artists who push the boundaries when it comes to using ballpoint pens for drawing. I'm in awe at what some of them have created. It's like these artists have turned the ballpoint pen into some sort of fine art tool. The chapters cover classical drawing, modern abstraction, graphic illustration, contemporary realism and sketchbook styles. There are some artworks that made me do a double take. Like is that created by coloured pencil or ballpoint pen? The techniques of the artists are fantastic. Portrait drawings or landscape sketches are drawn as if with pencils until you read the caption to see that everything's with ballpoint ink. I'm surprised that there are so many colours available for the pens. Matt Rota's the author of this book and he's also a skilful artist himself. 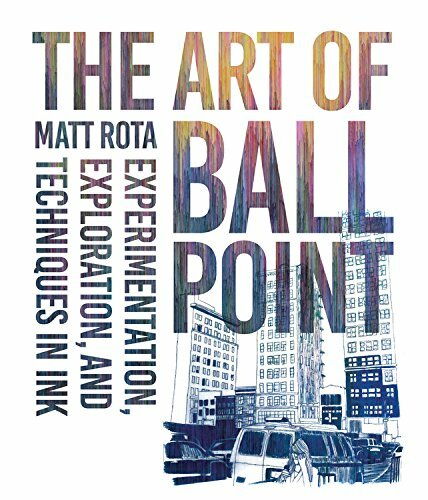 He has included the history of ballpoint pens, profiles and analysis of contributing artists and their work, and also wrote several tutorials in this book. The book's not just inspiring, it also teaches. This is a fantastic book. It will show you the possibilities of the humble ballpoint pen. This review copy is provided by book seller and distributor APD Singapore (website | facebook). You can get the book from them and major bookstores in Southeast Asia.